Research is central to Dr. Singh’s mission of bringing cutting edge spine care to his patients, and reflects his interest in carrying out scientific and educational work. Medical textbooks that Dr. Singh has authored and edited are listed below. 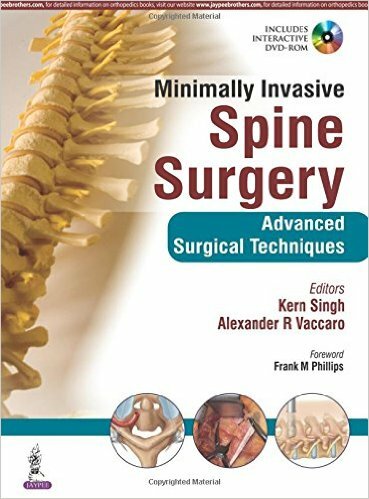 The textbook Minimally Invasive Spine Surgery: An Algorithmic Approach is an algorithmically-based book heavy on decision-making processes and factors determining the most effective MIS approach. The chapters of this book are organized in a very technique-focused text that provides intraoperative pearls, pitfalls and technical descriptions. The reader can quickly review the decision-making algorithm at the beginning of each chapter and read the text for a more detailed description of the decision-making surgical process. Readers will enjoy a high level of sophistication with the text. Routine procedures are covered in detail with particular emphasis given to surgical nuances and pearls learned from experienced MIS spine surgeons. Additionally, special topic chapters are discussed in detail such as Tumor, Trauma and Deformity. All levels of experience will truly appreciate the detail, clarity and sophistication associated with this comprehensive MIS Spine Surgery algorithmic textbook. Minimally Invasive Spine Surgery: Advanced Surgical Techniques combines up-to-date research on surgical techniques with high-definition surgical video and concise algorithmic evidence. Each of its sixteen chapters begins with a brief summary followed by imaging indications, instrumentation, a step-by-step surgical technique (and video guide), as well as the potential complications and adverse outcomes that may develop. Techniques discussed in the text include: Posterior Cervical Foraminotomy; Percutaneous Posterior Pedicle Screw Placement; Lumbar Discectomy; Transforaminal Lumbar Interbody Fusion (TLIF); Lateral Lumbar Interbody Fusion (LLIF). Also included is a discussion on the types of implants and instrumentation available today and the potential advantages they offer, making Minimally Invasive Spine Surgery an essential and relevant book for orthopaedic and neurosurgeons. 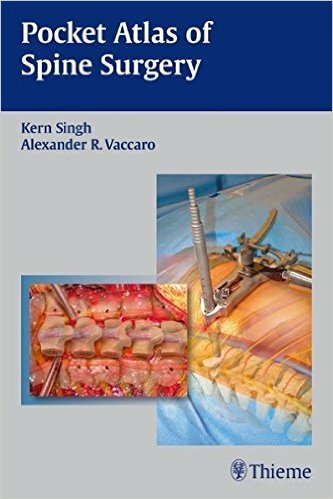 This book is a compilation of surgical techniques and pearls for the management of cervical, thoracic, and lumbar spinal pathology from some of the world’s most prominent figures in spine surgery. 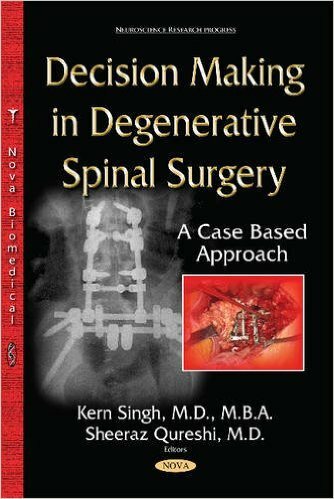 The chapters are organized by case vignettes to reflect commonly encountered spinal diseases such as cervical disc herniation, cervical myelopathy, lumbar disc herniation, lumbar spinal stenosis, degenerative spondylolisthesis, degenerative disc disease, and deformity as well as conditions including cervical pseudoarthrosis and thoracic disc herniation. The surgical approaches include disc replacement, fusion, decompression, and laminoplasty as performed by expert spine surgeons as they lend their know-how on both minimally invasive and open techniques for the surgical management of spinal pathology. 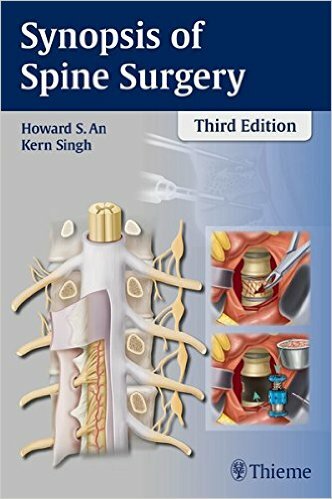 This book will enable spine surgeons, neurosurgeons, orthopaedic surgeons, fellows, residents, physiatrists, pain management professionals, and medical students to gain valuable insight into the typical presentations, appropriate evaluation, surgical techniques, benefits, complications, and the pearls and pitfalls in the treatment of spinal diseases. 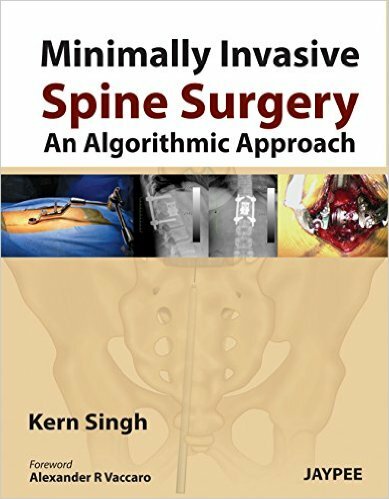 Dr. Kern Singh has designed this unique reference which offers expert advice, preferences, and opinions on tough clinical questions commonly associated with the spine. The unique Q&A format provides quick access to current information related to the spine with the simplicity of a conversation between two colleagues. Numerous images, diagrams, and references allow readers to browse large amounts of information in an expedited fashion. 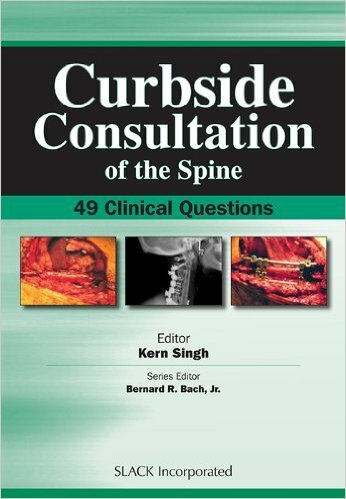 Curbside Consultation of the Spine: 49 Clinical Questions provides information basic enough for residents while also incorporating expert advice that even high-volume clinicians will appreciate. Practicing orthopedic spine surgeons, neurosurgeons, orthopedic and neurosurgical residents, and medical students will benefit from the user-friendly, casual format and the expert advice contained within. This atlas will serve as a valuable resource to orthopedic surgeons, neurosurgeons, and surgical trainees as well as physician assistants, surgical nurses, and all those involved in the operative care of patients undergoing spine surgery. Clinical information is summarized in an outline format, enabling readers to peruse broad topics in an expeditious manner. Chapters are categorically arranged, encompassing cervical, thoracic and lumbar spine pathologies. Within the framework of trauma, degenerative changes, congenital conditions, tumors, and infections – topics include spinal cord injury, thoracolumbar spine fractures; lumbar disk disease, stenosis, and spondylolisthesis; and spinal deformities in children and adults. Rounding out the volume are chapters on tumors, infections, and immune disorders that impact the spine such as rheumatoid arthritis and seronegative spondyloarthropathies.